"I am always deeply moved by your work and the creativity that you inspire in other people. It's like you create the space to allow what they have inside to pour forth. And at the same time, you make it fun and easy to participate." 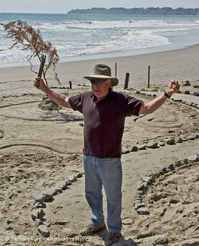 "I would like to express my deep thanks and gratitude for your taking the time to organize the 2007 Earth Day at Stinson. My son Fynn and I absolutely loved our experience there and we were moved by the community of artists and friends of nature gathered at the event. It was a transcendental experience for us, as we built stone monuments in the rain and experienced the deep community feel of the event. Somehow, five hours passed in a heartbeat as we created organic art in the rising tide. "I really appreciated your passion for the work of all the artists; it is clear you are deeply connected to art, nature, and the intersection of the two. My four-year-old son had a wonderful time and he was absolutely enthralled by the event. He could have built stone statues in the rain until the middle of the night. "Thanks again for putting on such a lovely event. We will be back next year for sure. Please know that organizing an event like this pays for itself in the form of lasting memories. You have helped create memories of art and nature for all who participated." "I thank you very much for holding this event, which has brought me to another passion! We are moving to a new house in a couple of weeks. There is a nice size front yard and a pretty big garden/patio area in the back. Ansel and I talked all the way back about creating art in these spaces using nature. We can't wait to bring a sense of peace to our new home...and liveliness too! "We will come to this event every year! Great day! We look forward to viewing the pics." "Thank you for putting together the Earth Day nature art celebration! I came with my almost 7-year-old granddaughter who had a great time building things in the sand, and was very pleased that you photographed her. When we came home, we went to your website and looked through your whole gallery. When that was done, she walked quietly into the living room, went to the basket of nature stuff (cones, seeds, stones, etc.) on the coffee table, and built a wonderful construction of pods and cones and stones. I wish I had a camera so I could show you. You clearly made a real impression. She is eagerly awaiting your photos of this year's event on the website." "Please continue to spread your wonderful energy around."